Although history is littered with remakes, there must be a reason why real classics are left alone. For instance, Casablanca has remained untouched since its 1942 release. As has 1941’s Citizen Kane, 39’s Gone With the Wind and The Searchers from 1956 to name just three. Even more recently, the world has yet to see a Star Wars or even a Back to the Future remake, and in truth, is never likely to either. The reason is, quite simply, that there’s no need, as is perfectly demonstrated by this unnecessary remake of the 1973 original, based on a true story. I really can't wait for the sales to start. I've been in line for 3 months. 1931, Paris, and Henri (Charlie Hunnam) is proving to be quite the successful safe cracker. On top of that, he’s in love with the beautiful Nennete (Eve Hewson) and they're planning a wonderful future together. The thing about plans though, is that they don’t always go the way you hope they do. Like when Henri is wrongly accused – and convicted – of a murder he didn’t commit and is sentenced to a long stretch at the notorious prison on Devil’s Island. It’s there that he meets a counterfeiter of a delicate persuasion, Louis Dega (Rami Malek). Dega isn’t really cut out for prison life, so quickly cuts a deal with Henri – if he does his best to protect him on the inside, Dega will underwrite any attempts to escape that Henri makes. And considering that Henri has nothing other than breaking out on his mind, he agrees. But Devil’s Island was named that for a reason, therefore Henri has his work cut out for him, not only in planning his escape, but also looking out for Dega. You really must have big kahunas if you think you’ve got what it takes to take on a classic; the ironic thing is though, Danish director Michael Noer doesn’t show any signs of balls – big or small – with his version of this tale. His vision is completely flat, devoid of any real flair or creativity. Although the original, starring screen icons Steve McQueen and Dustin Hoffman, was directed by an unfamiliar name in Franklin J. Schaffner, it should be pointed out he also directed Patton, Nicholas and Alexandra, The Boys from Brazil and 1968’s Planet of the Apes. Noer has directed, well, a few films in his native Denmark, and this, his first English speaking title. 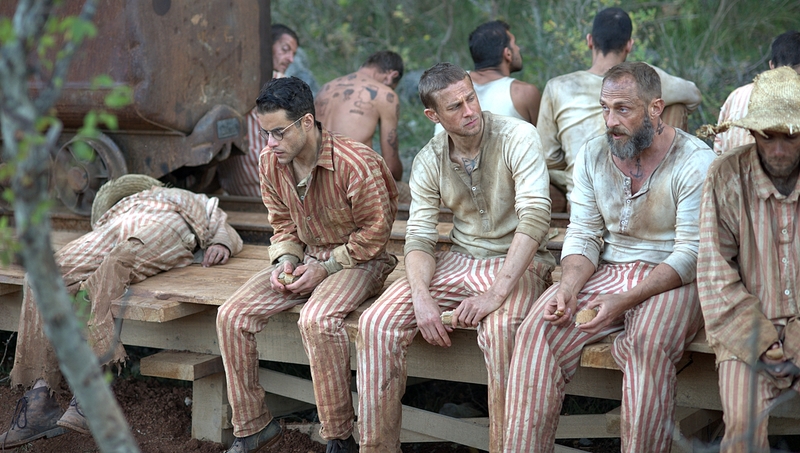 The film’s only saving grace, and it’s a flimsy one, are solid performances from both Hunnam and Malek. But who are we kidding, they’re no match for McQueen and Hoffman. If you’re going to be brave/stupid enough to attempt a classic, you have to be bold and bring something new to the table. Otherwise, you end up with a dull, lifeless chrysalis like this, which never amounts to anything and fails to take off.